Amherst New York, February 15, 2013: ISLF and the Sewalanka Foundation undertook a joint mission in July 2012 to formulate a project for establish a Technical Institute in the Trincomalee District. The period of the mission was 18 July to 11 August 2012. The mission was composed of Arumugam Kandiah, Director, ISLF, Sabanayagam Thevanayagam, Director, ISLF, Tim Dowding, Professor, University of Connecticut and Fulbright Specialist, Alagaiah Navratnarajah, Vice Chairman, Sewalanka Foundation, Naresh Newton, Institution Specialist, Sewalanka Foundation, and Ponniah Kandasamy, ISLF Sri Lanka Country Director. The participation of Professor Dowding, University of Connecticut, USA, was partially supported by funding provided under the “Specialist” Program” of the Fulbright Commission. The goal of the proposed project was to enhance the employment opportunity of the youth in the conflict affected areas of the Northern and Eastern Provinces and districts adjoining these provinces by providing them an opportunity to earn an appropriate tertiary education. The project aimed at establishing a Technical Institute at Gopalapuram in the Trincomalee District, called the Trincomalee Technical Institute (TTI). The TTI would offer to the GCE A/L and GCE O/L qualified students a 2-year Diploma (equivalent to an American Associate’s Degree) in Business Management. The mission had a “two-week” field programme during which it met with relevant institutions and officers in Colombo, Trincomalee and Jaffna. The mission took another two weeks to complete its report, which was a comprehensive project document detailing the establishment of TTI. The full project document can be viewed at the ISLF’s website (www.islf.org) under the “Resources” page. The Sewalanka Training Center (STC), at Trincomalee was proposed to be the hosting institution of the TTI. STC was constructed in 2011 with funding from Welthungerhilfe (WHH), a German NGO. The building sits on a 27- acre property. The total area of the building is about 28,000 sq ft. It is an excellent facility to host the proposed TTI. Postgraduate Institute of Management, Colombo. The Sewalanka Foundation has expressed its willingness to offer STC to establish the proposed Technical Institute. On August 10, the mission held a de-briefing meeting at which it presented the draft project document. 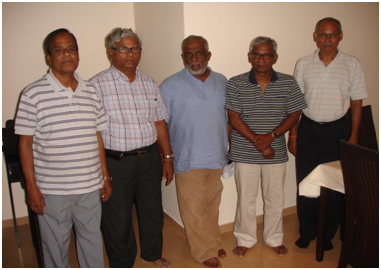 The debriefing meeting was chaired by Dr. Harsha Navaratne, Chairman of Sewalanka Foundation. The draft project document was reviewed and several revisions and improvements were made to the draft. It was agreed that ISLF and Sewalanka would jointly work out a follow-up strategy in order to implement the TTI project, as early as possible.